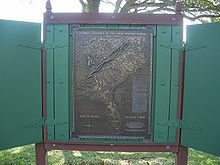 Beginning in the second half of the 16th century, the Kingdom of Spain established a number of missions throughout La Florida in order to convert the Indians to Christianity, to facilitate control of the area, and to prevent its colonization by other countries, in particular, England and France. Spanish Florida originally included much of what is now the Southeastern United States, although Spain never exercised long-term effective control over more than the northern part of what is now the State of Florida from present-day St. Augustine to the area around Tallahassee, southeastern Georgia, and some coastal settlements, such as Pensacola, Florida. A few short-lived missions were established in other locations, including Mission Santa Elena in present-day South Carolina, around the Florida peninsula, and in the interior of Georgia and Alabama. The missions of what are now northern Florida and southeastern Georgia were divided into main four provinces where the bulk of missionary effort took place. These were Apalachee, comprising the eastern part of what is now the Florida Panhandle; Timucua, ranging from the St. Johns River west to the Suwanee; Mocama, the coastal areas east of the St. Johns running north to the Altamaha River; and Guale, north of the Altamaha River along the coast to the present-day Georgia Sea Islands. These provinces roughly corresponded to the areas where those dialects were spoken among the varying Native American peoples, thus, they reflected the territories of the peoples. Missionary provinces were relatively fluid and evolved over the years according to demographic and political trends, and at various times smaller provinces were established, abandoned, or merged with larger ones. There were also ephemeral attempts to establish missions elsewhere, particularly further south into Florida. The Spanish used the term "province" for the territory of a tribe or chiefdom. There was no fixed definition of province boundaries. As tribes and chiefdoms lost population and importance, the provinces associated with them would no longer appear in the records. Other provinces expanded to take in their territories. Most of the people taken into the mission system were Timucua speakers. Three major groups that spoke other languages were also taken into the mission system. The Guale Province was the territory the Guale, and covered what is now coastal Georgia and the Sea Islands north of the Altamaha River. The Guale were among the first people to be taken into the mission system, in the 1580s. The Mocama Province included the coastal areas of southeastern Georgia and northern Florida from St. Simons Island south to St. Augustine, extending westward to approximately the distance of the St. Johns River in Florida. It included some of the earliest missions to be established, and served the Mocama, a Timucuan-speaking group of the coastal areas. Important missions established in the Mocama Province were San Juan del Puerto, among the Saturiwa chiefdom, and San Pedro de Mocama, among the Tacatacuru. ^ ""Episode 07 Spanish Mission Bell" by Robert Cassanello and Kevin Stapleton". stars.library.ucf.edu. Retrieved 2016-01-10. ^ Burnett, Gene (1986). Florida's Past, Volume 1. Sarasota, Florida: Pineapple Press. pp. 156–158. ISBN 1-56164-115-4. Retrieved October 9, 2013. ^ "Luna Expedition". UWF Anthropology and Archeology. University of West Florida. Retrieved 16 October 2018. ^ "Selected Chronology of European Colonization in the Southeastern U.S." University of West Florida. Retrieved 16 October 2018. ^ Childers, Ronald Wayne (2004). "The Presidio System in Spanish Florida 1565-1763". Historical Archaeology. 38 (3): 24–32. JSTOR 25617178. ^ a b Milanich, Jerald (1999). Laboring in the fields of the Lord : Spanish missions and Southeastern Indians. Washington: Smithsonian Institution Press. ISBN 1560989408. 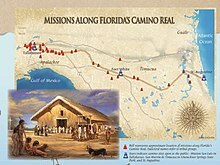 ^ "El Camino Real - Division of Historical Resources - Florida Department of State". dos.myflorida.com. Florida Department of State. Retrieved 31 July 2018. ^ Hann 1993: 92, 128. Wikimedia Commons has media related to Florida missions. Griffin, John W. (1993). "Foreword". In McEwan, Bonnie G. (ed.). The Spanish Missions of "La Florida". Gainesville, Florida: University Press of Florida. pp. xv–xvii. ISBN 0-8130-1232-5. Hann, John H. (1993). "The Mayaca and Jororo and Missions to Them". In McEwan, Bonnie G. (ed.). The Spanish Missions of "La Florida". Gainesville, Florida: University Press of Florida. pp. 111–140. ISBN 0-8130-1232-5. Milanich, Jerald (1999). Laboring in the fields of the Lord : Spanish missions and Southeastern Indians. Washington: Smithsonian Institution Press. ISBN 1560989408. Milanich, Jerald (1999). The Timucua. Wiley-Blackwell. ISBN 0-631-21864-5. Retrieved June 16, 2010. McEwan, Bonnie G. (1993). "Preface". In McEwan, Bonnie G. (ed.). The Spanish Missions of "La Florida". Gainesville, Florida: University Press of Florida. pp. xix–xxi. ISBN 0-8130-1232-5. Saunders, Rebecca (1993). "Architecture of the Missions Santa María and Santa Catalina de Amelia". In McEwan, Bonnie G. (ed.). The Spanish Missions of "La Florida". Gainesville, Florida: University Press of Florida. pp. 35–61. ISBN 0-8130-1232-5. Thomas, David Hurst (1993). "The Archeology of Mission Santa Catalina de Guale: Our First 15 Years". In McEwan, Bonnie G. (ed.). The Spanish Missions of "La Florida". Gainesville, Florida: University Press of Florida. pp. 1–34. ISBN 0-8130-1232-5.